Every idea starts with a spark. Introducing the Fireside Collection by JAW Woodshop, a new body of work that showcases the stark beauty of scorched lumber. This natural aesthetic is rooted in shou sugi ban, the traditional Japanese technique of lightly burning cedar siding to improve its weather-resistance. It may seem counterintuitive but burning wood in a controlled manner actually makes its cellular structure more durable. The tree's spring growth quickly chars, while the stronger lignins of late growth remain, leaving a subtle flame-rippled surface. I find the task of applying fire as a fine woodworking tool to be a welcome challenge. Using flames of different sizes, the lumber is carefully scorched, then wire-brushed and sanded smooth. All ash is removed and the surface is finished with a durable varnish. This timeless texture is completely clean to the touch and satisfying to the senses, noticeably charred yet flat and functional. When paired with a striking slab of local hardwood, the contrasting finishes remind us of the remarkable versatility of wood, our most sacred building material. 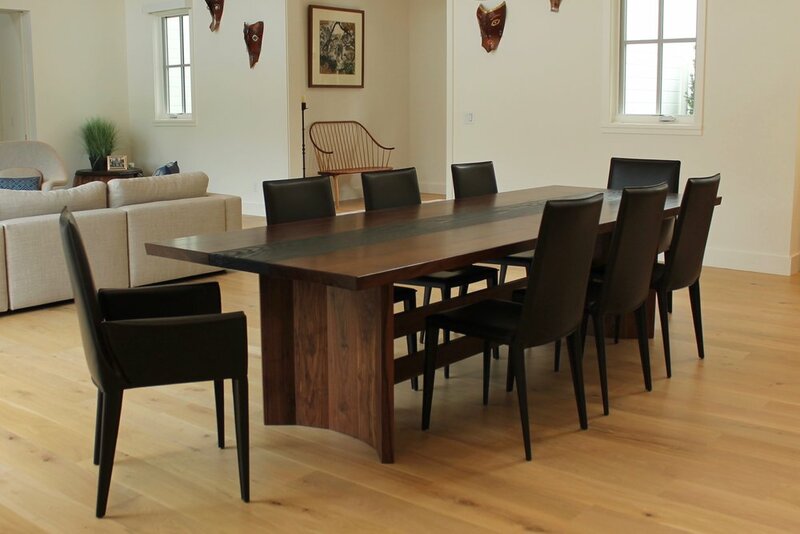 Every piece of furniture from JAW Woodshop is lovingly handcrafted by a single pair of hands, custom-made to a client's space and sensibility. The choices of dimension and wood species are up to you. Whether you need a ten-foot-long dining table or a narrow nightstand, a low-profile coffee table or a high-end credenza, every Fireside piece is designed to fit into your life. You make the fun choices, I'll make the fine furniture. Please contact Johnny at jawwoodshop@gmail.com for pricing.